National Geographic Outpost: In Search of Human Origins - a great site that has a cool graphic interface and covers a great deal of information about prehistory. BBC: Prehistoric Life - a graphically intensive site with loads of great information! Best of History: Prehistory - lesson plans, resources, links, art and more. Lascaux: A Visit to the Cave - explore the world famous Lascaux cave virtually; you actually can "walk" through the cave! Art History on the Web: Prehistoric Art - links to tons of prehistoric art! Catal Hoyuk - visit the world's first city; great interactives! Petroglyphs, Pictographs, Cave Paintings, Geoglyphs - How did the first humans communicate? Check out this site! Preserving Ancient Statues from Jordan - discover the ancient statues of Jordan, see how they were made and preserved. The Cave of Chauvet Pont-D'-Arc - a great interactive visit to the cave! A Virtual Tour of Cave Paintings - What do these cave paintings mean? Check out the various caves in this collection. Archaeology Magazine - Ever wonder how we learn about early civilizations? Go on an archaeological dig, review info, and journey to an ancient dig site. 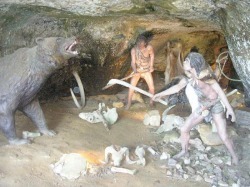 History Link 101: Prehistoric Man - connects you to the best of Cave and Rock Art, Daily Life, Maps, Pictures, and Research on Prehistoric Man. Mysteries of Catal Hoyuk - a interactive, cartoon-illustrated site that explores the world's first city.